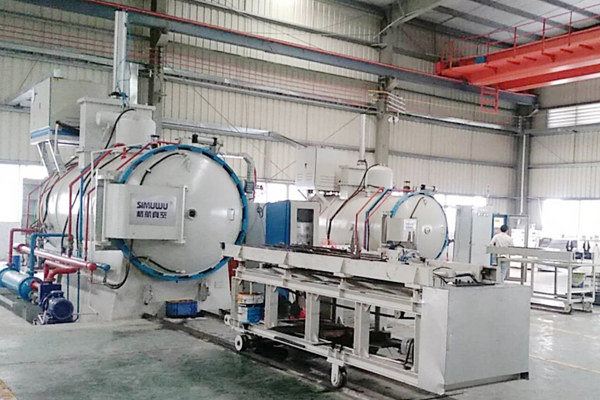 Horizontal double-chamber vacuum air-cooled oil quenching furnace is mainly used for quenching in vacuum oil medium of alloy structural steel, bearing steel, spring steel, mold steel, high-speed steel and the like, and annealing, air-cooling and the like of the above related materials. Octagonal furnace heating structure, good temperature uniformity. Heating elements using ceramic parts support technology, prolonged use of 5 years do not worry about the decline in insulation performance. The inner material trolley adopts the integral telescopic structure with superposition, frequency conversion and speed regulation, the material is delivered smoothly, the execution of “full – fast – slow” operation beats, the transfer time is short. Built-in heat exchanger and forced air circulation cooling method, the jet gas uniform and flow, cooling speed. Quenching tank capacity, hot oil pump and the heat exchanger outside the cooling cycle, quenching oil cooling better. Dual choice of oil mixing and oil jet cooling method for different types of parts, small deformation of the workpiece. The same specifications of products, loading large capacity, high efficiency. Automatic external car, remote control, loading and unloading material only one operator.